Bayard Rustin was the primary organizer responsible for the 1963 March on Washington for Jobs and Justice which was held 50 years today. The march is considered one of the most important moments in the civil rights struggle for racial equality and the fact that an openly gay man was key in its organization and efficient execution is worth noting, but often has not been. I feel compelled, as secretary of labor, to pay tribute to him as well. My very first day on the job last month, I toured our department’s Hall of Honor to see the heroic Americans enshrined there – Frances Perkins, A. Philip Randolph, Cesar Chavez and others. But where was Bayard Rustin? He was one of our most tenacious fighters for the rights of workers, for collective bargaining, for the role unions play in expanding economic opportunity. The 1963 March on Washington that he organized – the “March on Washington for Jobs and Freedom,” as we all know, was the full name – was conceived as a demonstration against economic injustice. He understood as well as anyone that these two movements – civil rights and labor rights – are inextricably intertwined and their goals essentially the same. 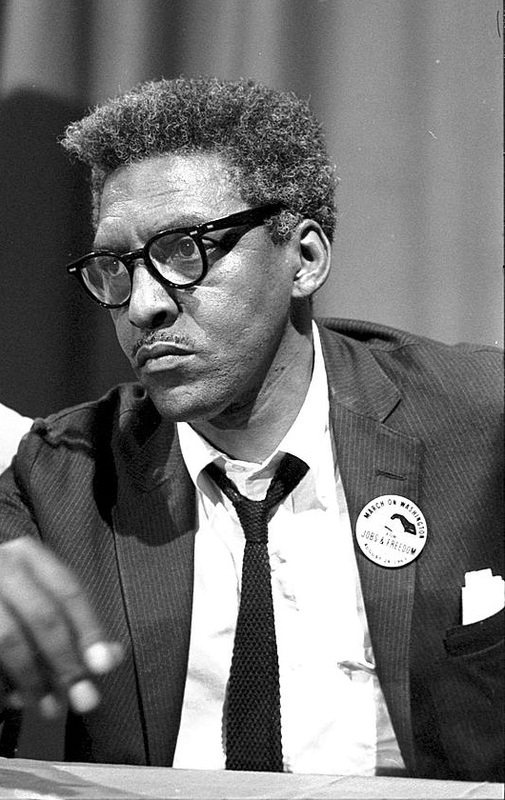 So, I am correcting a longstanding oversight by formally inducting Bayard Rustin into the Labor Department’s Hall of Honor. Rustin was an openly gay man during a time of fear and intolerance. There was no Human Rights Campaign. There was no Pride Month. There was no “It Gets Better” campaign featuring some of the most visible public figures in America. Nope, “it gets better” was just something you had to believe when you told it to yourself. This entry was posted in Uncategorized and tagged "San Francisco 50 Anniversary of the March on Washington", "San Francisco Celebrates 50th Anniversary of the March on Washington", "San Francisco March on Washington", "San Francisco's March on Washington", African-American, August 28 2013, Bayard Rustin, Bayard Rustin Coalition, Bayard Rustin Coalition Civil Rights Rally Commemorates 50th Anniversary of The March on Washington, Bayard Rustin Lecture Series, Bayard Rustin LGBT Coalition, Bisexual, black equality, Black History, Black LGBT History, BRC, BRC Annual African American SF Pride Celebration, Brother Outsider, Castro, Celebration, Entertainment, Events, Exiciting, Fun, Gay Marriage, Gay Pride, Gay Rights, Happening, Jordan Rustin Coalition, Lesbian, LGBT Pride, LGBTQ, Mandy Carter, March on Washington 50th Anniversary, National Black Justice Coalition, News, Oakland, Political Mastermind Bayard Rustin, Progressive, San Francisco bay area, San Francisco Celebrates the March on Washington, SF Pride 2013, Transgendered by Bayard Rustin Coalition. Bookmark the permalink.